This amazing soup takes little active work, is very low in fat and calories, but delivers incredible depth of flavor. The trick: sweating the vegetables in a covered pot slowly, then adding just a bit of flour to thicken up the base for a velvety mouth-feel. While an immersion blender may be easier to use than a blender, I prefer the latter to obtain a rich, creamy texture. Feel free to omit the bacon for a completely vegetarian dish; garnish with a few roasted cauliflower florets instead in this case, to provide visual contrast. Place the olive oil, onion, celery, garlic, and thyme in a 3-quart pot with a tight-fitting lid. Cover and set over medium-low heat. Cook until the vegetables soften, about 10 minutes, stirring once in a while as needed to prevent scorching. Uncover, add the cauliflower, stir well, and cover again. Cook until the cauliflower softens, about 10 minutes, stirring once in a while and adding water if needed to prevent scorching. Uncover, stir in the flour, and cook for 3 minutes, stirring often; the flour should lose its raw smell and the cauliflower and vegetables should become coated with the flour. It is fine if the cauliflower and vegetables take on a little color; this will only deepen the flavor of the soup. Season with the salt and pepper. Pour in the milk, stirring to avoid lumps forming. Add the water and cover. Bring to a gentle boil. Simmer for 30 minutes, or until the cauliflower is very soft (it should fall apart when poked with a spoon) and the flavors have melded. Be sure not to cook the soup over too high a flame, as the milk may curdle (even if it does, the soup will be blended later, so it is fine). Transfer to a blender, being careful as the soup is quite hot. Cover the blender lid with a towel to prevent splashing and puree the soup until thick and smooth, about 2 minutes. If the soup is too thick for your taste, add as much water as needed to dilute to a consistency you like; the soup should be thick enough to coat the back of a spoon. Return to the pot and keep warm. Adjust the seasoning as needed. When you are ready to serve, place the diced bacon in a skillet and cook over medium heat until golden and crispy. Drain on paper towels. 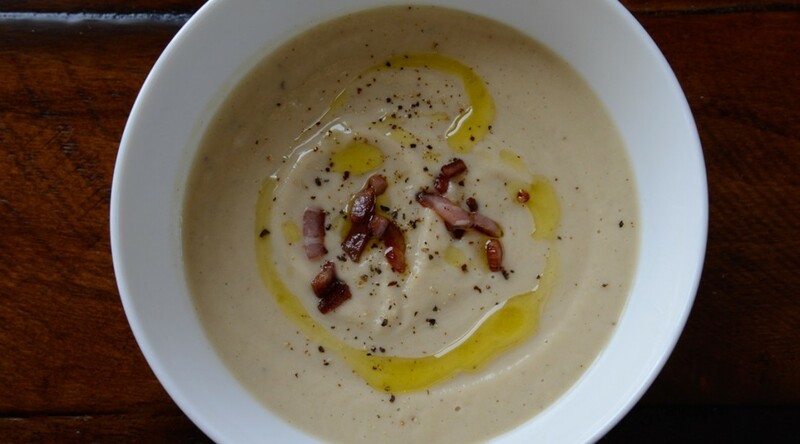 Serve the soup hot, drizzled with the truffle oil, garnished with the crispy bacon, and sprinkled with freshly ground black pepper.